The speed of disease progression depends on the balance of mutations that impair immune recognition of HIV and those that hinder viral replication, Emory research has shown. T cell under attack by HIV; EM image courtesy of NIAID. A new study from Emory AIDS researchers shows how the expected disease severity when someone is newly infected by HIV reflects a balance between the virus' invisibility to the host's immune system and its ability to reproduce. Examining HIV transmission events occurring in 169 heterosexual couples in Zambia, the researchers found that almost a third of potential immune target sites in the virus that established infection were "pre-adapted" to the immune response in the newly-infected partner. 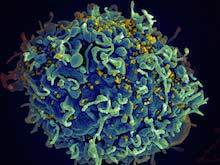 That means that HIV had already evolved to evade immune scrutiny in the newly-infected person. The researchers' findings suggest that designers of vaccines against HIV should focus on regions of conserved viral proteins that do not become adapted in the same way. The study, published Monday in Journal of Experimental Medicine, was led by Eric Hunter, PhD, professor of pathology and laboratory medicine at Emory University School of Medicine, Emory Vaccine Center and Yerkes National Primate Research Center. Hunter is a Georgia Research Alliance Eminent Scholar and co-director of the Emory Center for AIDS Research. The first author is postdoctoral fellow Daniela C. Mónaco, PhD. This analysis builds upon previous research by Hunter and colleagues on the transmission event and is consistent with work developed in parallel where viral adaptation was defined using a computer model. For constantly mutating HIV, there is a tug-of-war between pressure from the host's immune system and changes that impair the virus' ability to replicate, Hunter says. Both of these factors influence the level of virus found in blood and how quickly it can induce CD4 T cell loss and progression to AIDS in the newly-infected person. The human genes that direct the immune response to HIV encode HLA proteins, which vary from person to person. The HLA proteins hold chewed-up pieces of viral proteins so that CD8+ T cells (so-called "cytotoxic" cells) can detect and kill infected cells. In response, the virus mutates so that the bits of viral proteins don't trigger immune alarms. "There's a critical balance between viral polymorphisms that reduce immune recognition and others that negatively influence replicative fitness," Monaco says. "By taking both into account, we could better estimate the overall impact on viral load and disease progression." The study was made possible by the Zambia-Emory HIV Research Project, led by co-author Susan Allen, MD, MPH. The Project's HIV prevention programs enroll heterosexual couples with one HIV-positive partner. These programs provide counseling and condoms, but HIV transmission still occurs despite a two-thirds reduction in infection rate. The research was supported by the National Institute of Allergy and Infectious Diseases (R0AI64060, R37AI51231, P30AI050409), the NIH's Office of Research Infrastructure Programs (Primate centers, P51OD011132), the International AIDS Vaccine Initiative, the U.S. Agency for International Development, and Action Cycling.